As much as its results are rewarding, home renovation is a living hell. Regardless of whether you are renovating the house you currently live in, or the one you just bought, whether it is to fit your changing needs or to sell, there are certain things you should not overlook. The right shade or texture can make your kitchen look bigger, smaller or even cheerier with the help of kitchens Northern Beaches. Determine what you want to do and which parts of your house you need to renovate. Make a list of priorities. Once you have that done, get the contractors in to give you an estimate. The Estimate is probably not going to be the final price, so round up the amounts and see how much of your list you can afford. Start from the top priorities and make sure you can finance those. Also, it would be good to do things in the same order as on the priority list just in case you happen to run out of money but I would not suggest even starting if your budget is that tight. If you need to hire a professional to do any part of the renovation job (you will), make sure you get a top quality service. Check the references the contractors give you and see if you can find any reviews online. Try to find out whether the contractors you are looking at are currently working on something else as they tend to accept a job even though they are aware they cannot manage it all because they do not want to lose it. This usually proves to be an issue when it comes to deadlines. The professionals you will most likely be after are plumbers, carpenters, builders, painters, architects, landscapers and interior designers. Why hire landscapers, interior designers, and architects? Sure, there are a lot of things you can do yourself, but there are even more things you think you can do yourself. You need an architect if you are planning on remodeling any part of your house, especially if you are building an extension. A landscaper will come in handy in case you have money left over to fix up your backyard, they can put your wishes into a meaningful whole. An interior designer is there to help you get the best out of space once remodeled. They can also assist you with installing new lights as home renovation is the right time to add more lights and power sockets into a house. This is the perfect time to check your house’s wiring and plumbing. Perhaps they require some maintenance. Also, as I have mentioned above, this is the right time to install additional power sockets as there are never too many. Plumbers from The Relining Company remind us that plumbing needs to be taken into account when remodeling, so it is best to get a professional to work with the architect on this or based on the architectural plan. Rethink your heating, is it worm throughout the house or are some rooms slacking? If there is an issue, it should be taken care of now. Think ecology and energy efficiency and find other ways of keeping your house warm or building one of the modern ecological heating systems such as a geothermal heating pump. This one probably requires the most work done. You need to take down your old tiles, see if you need to get new elements and people usually do as they do not want to bring old into the new. You will also need new fixtures. Depending on your and your family member’s needs you might need to install certain extra details. If you have an elderly person living with you, you may want to install certain features such as a walk-in shower or grab bars to help them out as they are not getting any younger. These can also increase your property’s price if you decide to sell one day. Apart from remodeling and possibly adding an extra closet or a pantry, there are several other things to be done in your kitchen. It probably needs to be re-plumbed and the cupboards remodeled. Consider adjusting the height of countertops for children to be able to reach as well as the elderly if they want to sit down when preparing food. Make sure you have enough space for the appliance you are using on daily bases and enough worktops to prepare meals. You will probably need new fixtures, not only for the kitchen but for the entire house, and it is always advised to put everything on paper first, so you know exactly how much you’re spending. The final advice is to be patient as eventually it will all be done. Regardless of what you believe at first, find a place to stay at while the work is being done, living in the house will drive you even further insane. Also, keep in mind that once you have everything ready, you’ll need to keep it squeaky clean to be able to fully enjoy your beautiful new home. 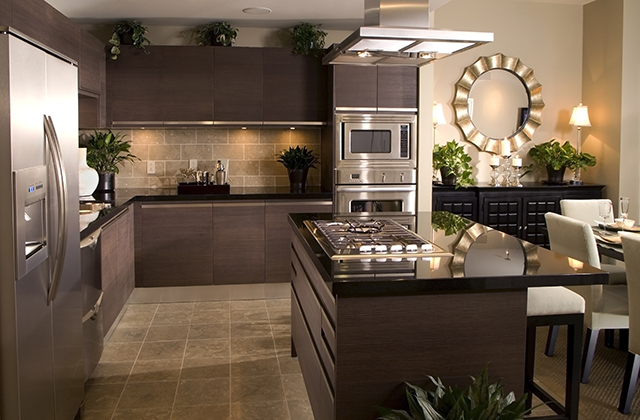 Get in touch with our kitchen builders for remodeling your kitchen.